As an Office 365 admin, you play an important role in delivering the best possible productivity for your users and organization. We share in this mission and remain committed to providing you a reliable service and transparency into our operations. Office 365 is designed with service continuity at the very center and we stand by this commitment through our financially backed guarantee of at least 99.9 percent uptime. Reducing the frequency and impact of service incidents remains an important part of our continuous improvements. We do not take lightly the imperative we have to earn your trust through reliability. This is why we invest in resiliency and redundancy at every layer of Office 365 and design with the core principle of ensuring a highly available service. As with any cloud service—and despite all our efforts—incidents can and do occur that may impact your experience. We realize that in these critical moments, it’s how we respond that makes all the difference for you and your organization. We’ve heard your feedback that receiving actionable communications that are timely, targeted and accurate during service incidents is essential. Based on this feedback, we made a number of improvements and today we’d like to share this progress and announce the availability of two new capabilities: push notifications and programmatic access to Office 365 service incident communications. 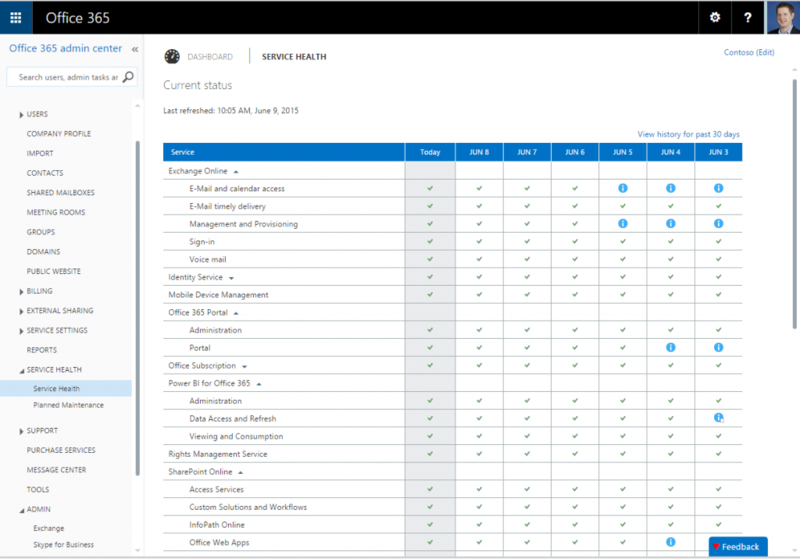 Your first and best resource for staying informed in the event of an Office 365 service incident is the Service Health Dashboard. Signing into the Office 365 admin center provides you a personalized, detailed and up-to-date view into the availability of the Office 365 services you have subscribed. If there is an incident that impacts your service experience, the Service Health Dashboard is our primary communication channel to keep you current with what is happening and the steps we are taking to rapidly recover. After an incident, this is where you can review root cause details and access a 30-day history of past events. We’ve heard your feedback that the information we provide needs to be actionable. What follows is an update on how we’ve made improvements to better support you with the transparency and detail to understand the incident and how to best mitigate the impact for your users. First, we constantly strive to reduce the amount of time it takes to identify and then notify you about an incident affecting your Office 365 tenant. Through investments in new processes, which include advanced machine learning, anomaly detection and automation, we have already reduced the time to your first alert by 60 percent in many cases. We remain committed to reducing this even further. You also told us that more frequent status updates and faster post-incident analysis is vital for you to keep your organization informed. To support you better through these events, we added new details—such as the expected user experience, potential workarounds, estimated time to restoration and initial root cause analysis—to the regular updates posted to your Service Health Dashboard for a particular incident. This provides you greater context around the scope of the issue and helps you mitigate the impact on your users while we rapidly restore your service. We have an improved experience for your users through the introduction of new intelligent error messages. Today, Office 365 can inform your users if their access to SharePoint Online may be interrupted due to an ongoing service incident. The goal is to reduce the need for your users to call your help desk. Other Office 365 workloads will be supported in the coming months. Similarly, Office 365 can alert you if there is an active service incident affecting your tenant at the time you are initiating a new service request. We’re also focused on providing you proactive notification if Office 365 detects an issue that could cause a future service incident. 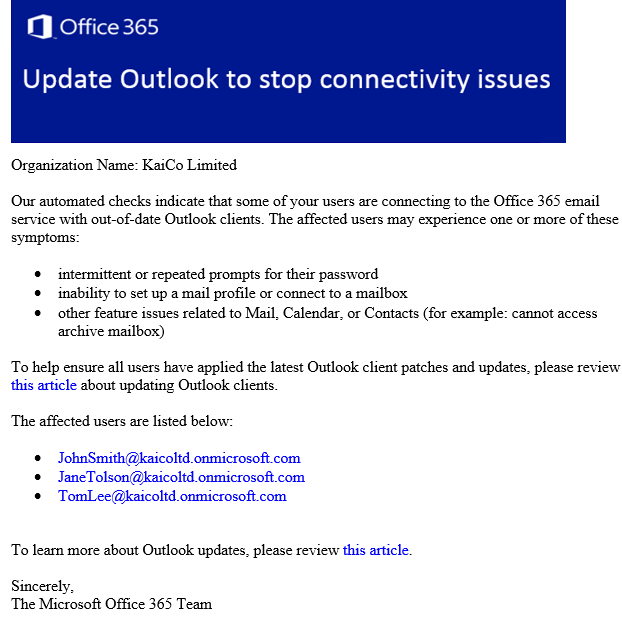 For example, alerting you that some of your users are connecting to Office 365 with an older version of Outlook that may result in reliability issues. 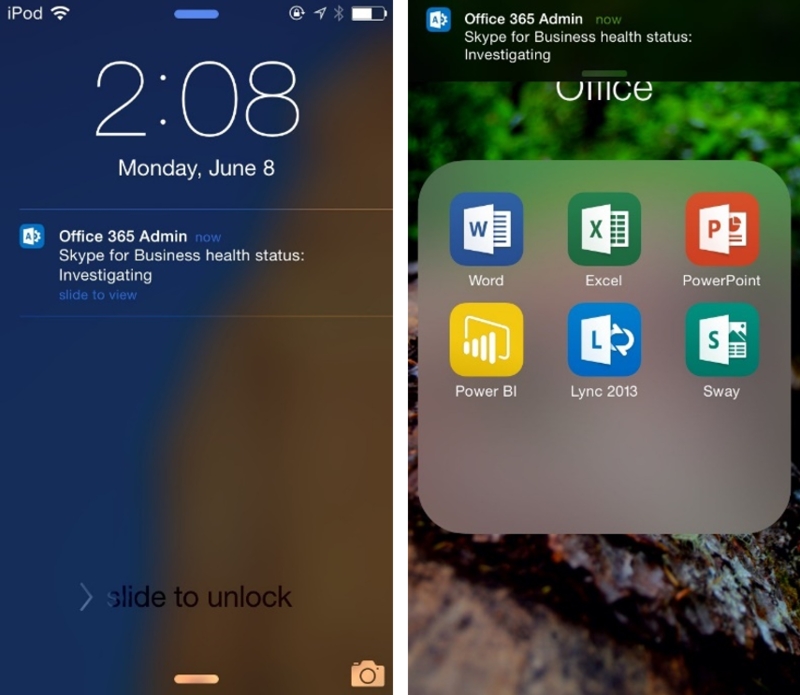 Today, we’re excited to announce the availability of new service incident push notifications with the Office 365 Admin app for Windows Phone, iOS and Android devices for first release customers with the worldwide release to follow. Now, when you are on the go and away from the Office 365 admin center, you can be alerted immediately if there is a service incident affecting your users and you’re one tap away from access to important details on any actions you can take to mitigate impact. And, you can stay current on the latest service health status from the same app. If you already have the Office 365 Admin app, this capability is available today. All you need to do is configure your notifications. We will continue to enhance and expand your options in future updates to the Office 365 Admin app. This includes adding more modalities for alerts—like SMS and email—and more customizable notifications. We are also excited to announce the availability of a public preview of the Office 365 Service Communications API. The Service Communications API offers you programmatic access to Office 365 service incident communications. With this API, you now have the ability to surface critical Office 365 service communications directly within your existing help desk tools and service management solutions and simplify how you monitor across service health across your environment. The API gives you the flexibility to monitor real-time Office 365 service health status, as well as access historical details. Several leading providers of service monitoring and management solutions have already started to integrate this new API into their own offerings, including BetterCloud, ENow, Cogmotive and Exoprise. For an example of how the API is enhancing partner solutions, check out this video from our partner Exoprise. To get started with the new Office 365 Service Communications API, visit MSDN where you can access sample code to start building your solutions. Even with the progress we shared today, we remain relentless in our commitment to delivering a reliable, highly available service that exceeds your expectations. Core to delivering on this promise is our accountability through transparency as evidenced by the uptime numbers published to the Office 365 Trust Center. We encourage you to try out the new capabilities featured in this post and hope you find these improvements more useful. As we continue to build upon these investments in the coming months, your feedback is vital and welcomed. We will be hosting a YamJam next week on Tuesday, June 30th 9:00-10:00 a.m. PDT on the Office 365 Network to take your questions and feedback live. Learn even more about Office 365 service incident management by watching our Microsoft Ignite conference session, “What Really Happens When There Is a Service Incident with Office 365, and What’s My Role?” and this brief video. 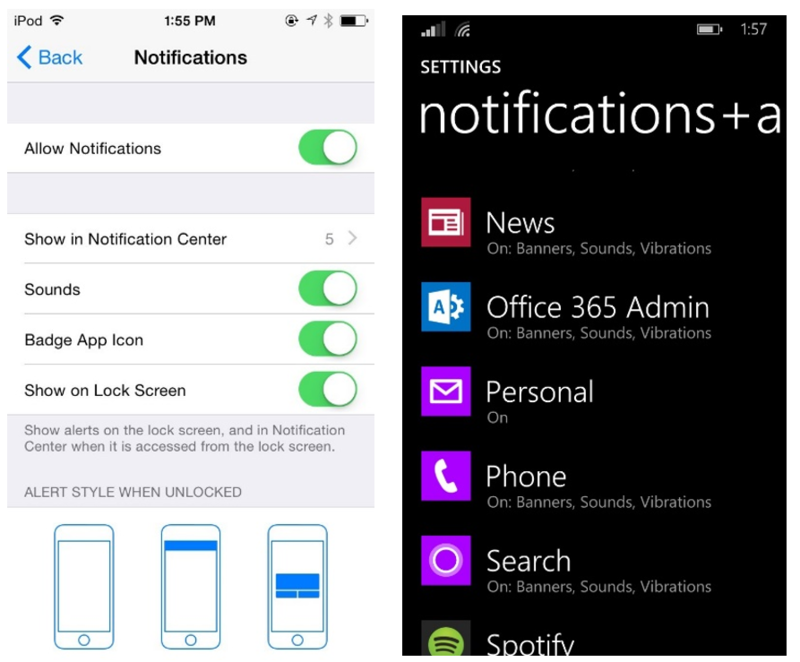 Q: Can an administrator turn off the Office 365 Admin app notification messages? A: Yes, administrators have the ability to turn off notifications at any time in the phone settings for notifications. Q: When will push notifications be available for Message Center communications? 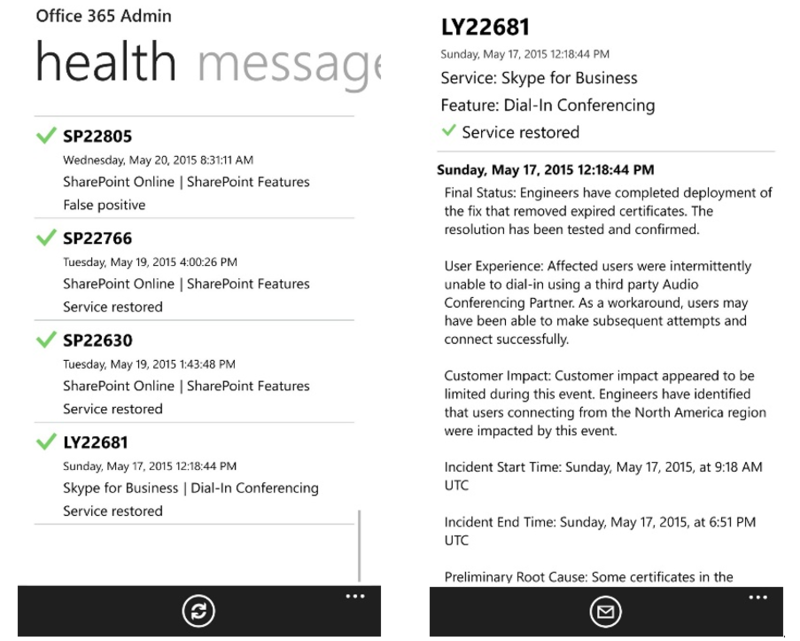 A: Message Center notifications will be available in the third quarter of 2015. Q: When can I expect more customization for push notifications, such as being able to select specific workloads like Exchange Online or additional communication channels like email and text? A: We will continue to enhance and expand your options in future updates to the Office 365 Admin app. This includes adding more modalities for alerts—like SMS and email—and more customizable notifications. 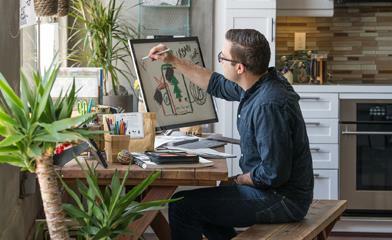 Q: Which Office 365 customers are receiving these benefits? A: Tenant administrators for Office 365 customers including commercial, government and academic plans will be able to use the admin app and Office 365 Service Communications API.